The mountain bike race season is done, vacation is done, and now it is time to play. I purposely built this year around being in good racing shape for the spring and early summer and then wanted to hit vacation in July as a nice reset. Now there are two goals for the rest of the season. So far the hiking is off to a good start and we have some camping lined up in the coming weeks. 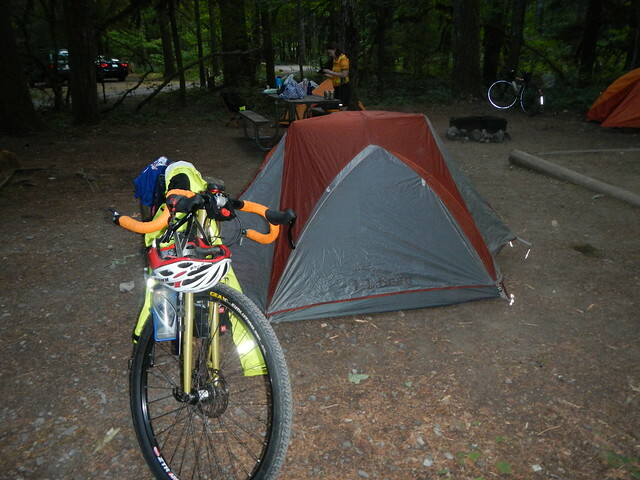 This weekend though, I got to combine both riding and camping with another trip with the Cyclewild folks. 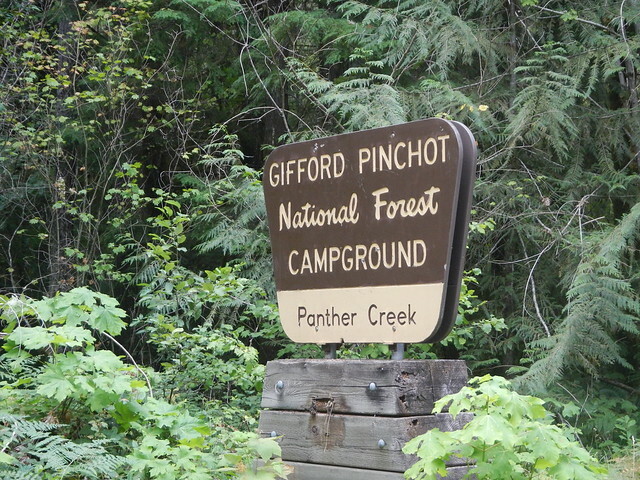 We headed out from Portland to Panther Creek Campground in the Gifford Pinchot National Forest. 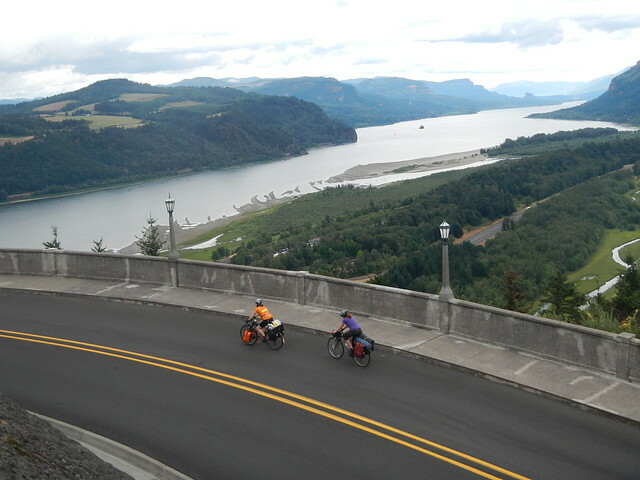 It was about 60 miles from Portland with a mix of bike paths, busy roads, quiet roads, and a short and crappy section on Route 14 on the Washington side of the Gorge. Only 8 people signed up for this trip which was a bit of a surprise. The other trips I’ve done with them have all filled up. I kind of figured that this one was a combination of distance and it’s prime vacation time so people probably have other plans. 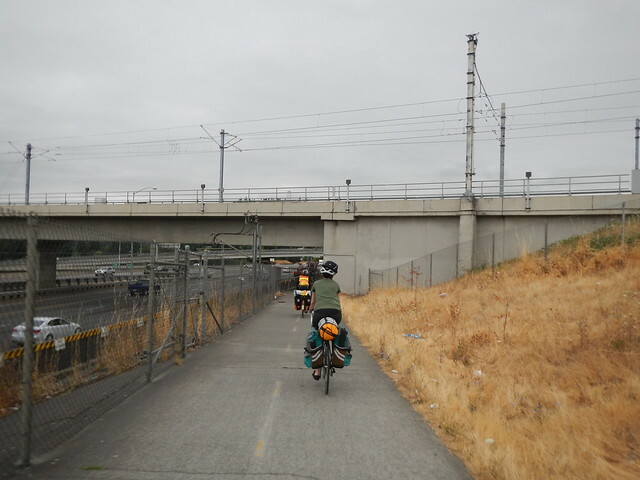 I was pretty happy to learn a bunch more about SE Portland that I don’t know and to learn how to connect the 205 Bike Path with Marine Drive and onto Historic Highway 30. 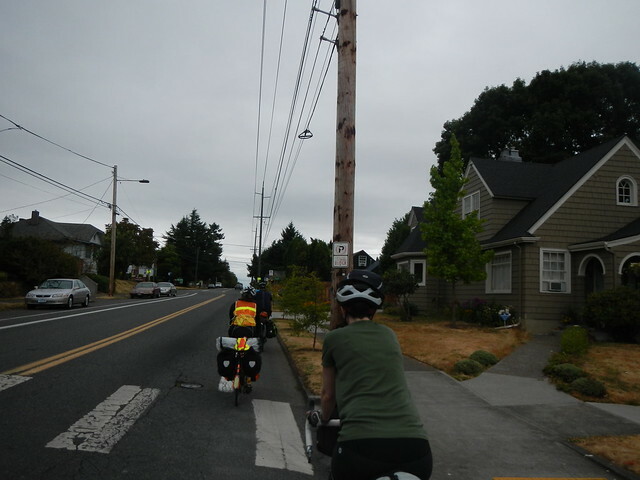 I took the MAX out to 82nd Ave and biked a very short distance down to Stark to meet people at the Bipartisan Cafe. Shortly thereafter we were on our way. 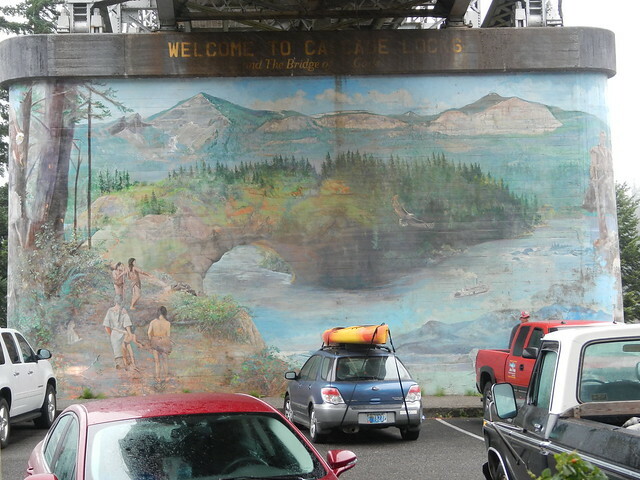 After the 205 path and then the fairly boring Marine Drive, we turned up into Troutdale which is the start to the historic highway. I’ve passed the entrance to Main Street here lots of times headed to Mt. Hood, but we have never turned left to check it out. From here we gently climbed and got misted and heavy drizzled on for the next 30 or so miles. It was enough to be annoying, but not enough to really soak you through. We all did take rain gear on and off several times over the next 3 hours though. 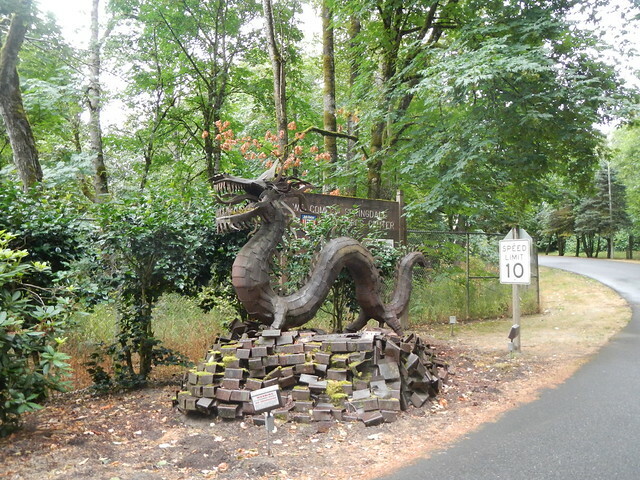 Not sure what the Portland Women’s Forum Monument was all about until I went to Google. Then it was a sweet descent down the other side and onto Multnomah Falls, which was PACKED with people even on a rainy Saturday. 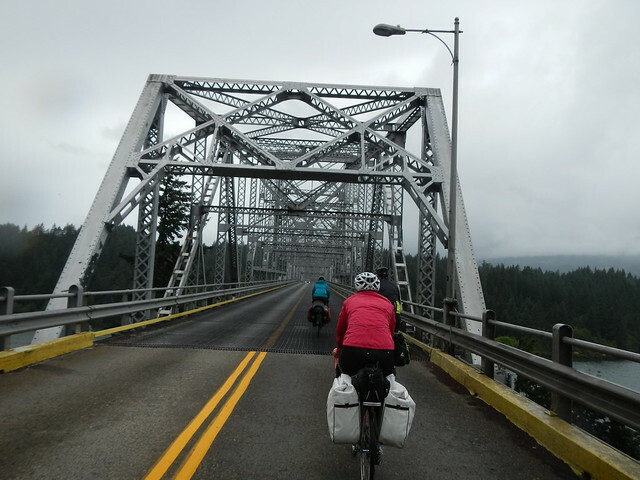 Until recently some of the more commonly traveled portions of historic hhighway 30 sent cyclists on to Interstate 84. 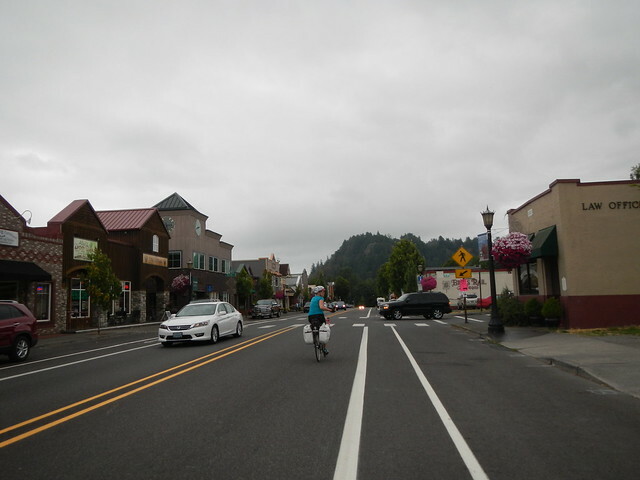 Now from Troutdale all the way to Cascade Locks you can ride the road or a separate bike path thanks to a couple important connectors being finished in the past few years. 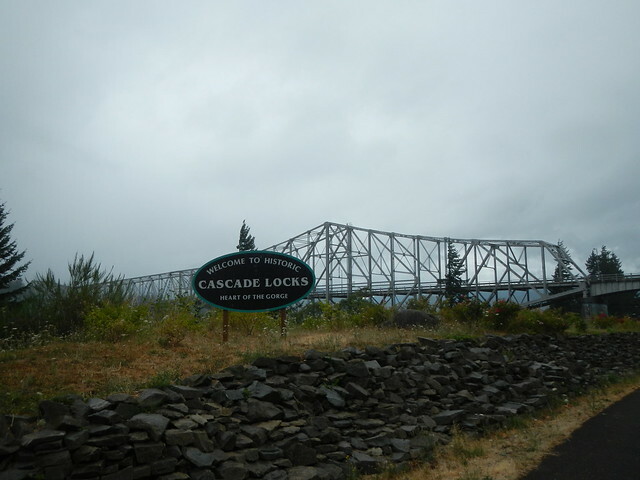 This was also my first time across the Bridge of the Gods to get to Washington. 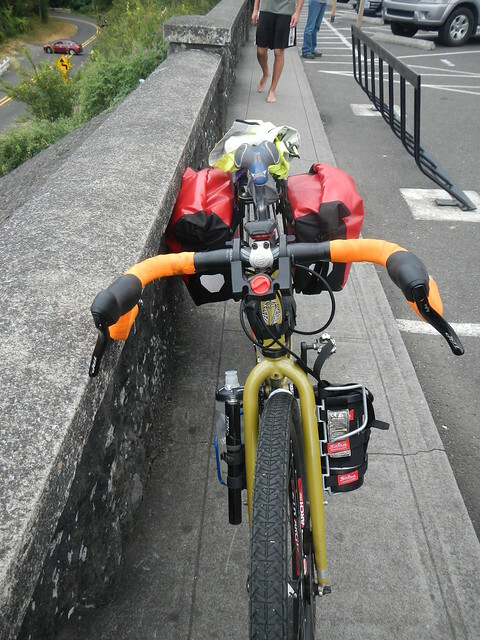 We had to pay a whopping 50 cents each as cyclists. 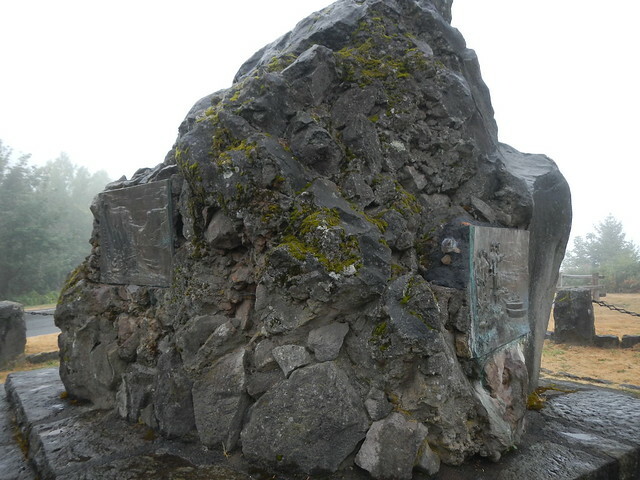 It’s also part of the Pacific Crest Trail as it crosses from Washington into Oregon. 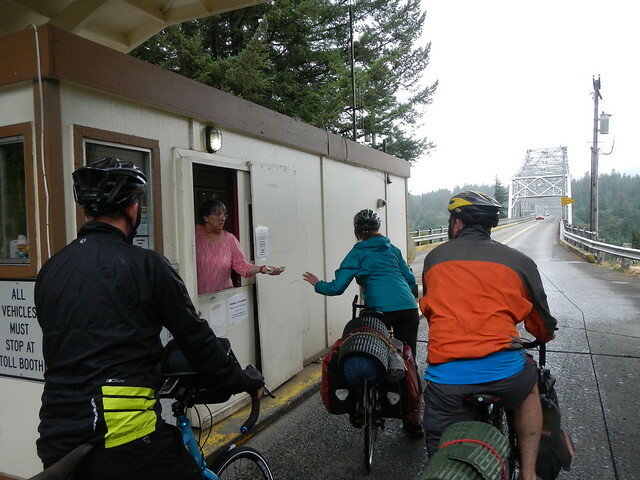 The bridge is a metal deck and because of the rain it was a bit sketchy for those in the group with skinnier tires. I had no problems with 2″ tires on the Fargo. 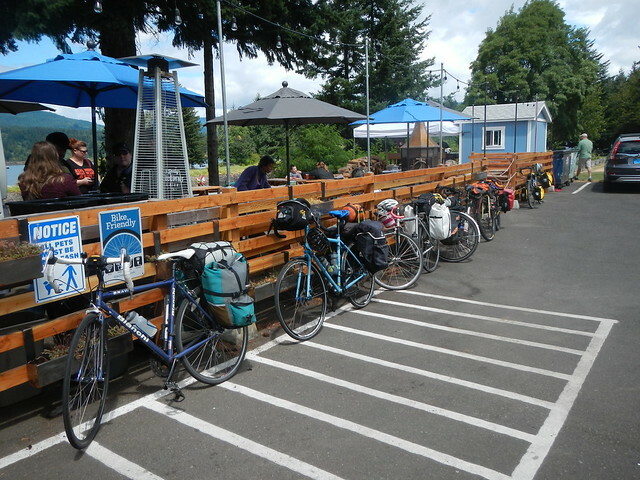 We stopped for lunch at Walking Man Brewery and then rode up into the the national forest to the campground. 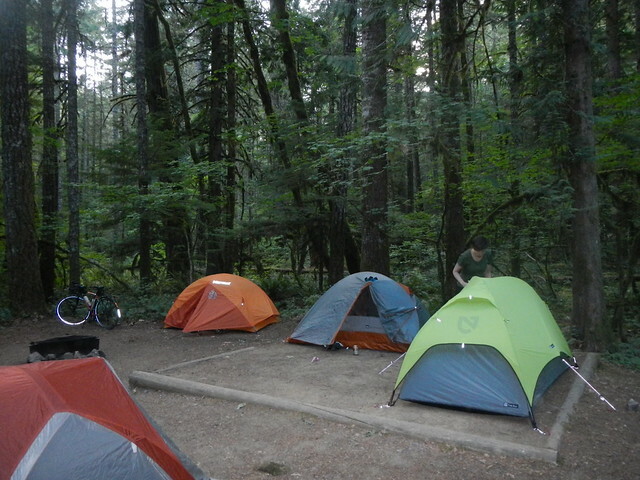 The campground has some beautiful sites and it was pretty quiet. Luckily after all the drizzle and rain we had been through, the ground here was quite dry. We had a nice night by a warm campfire and got to know each other better. Interesting mix of personalities and ages. Surprised though there were 3 of us who are government employees, 2 city workers and a federal employee. We had a late start due to some people sleeping late….too much beer the night before(?) and just a fairly laid back approach to the morning. The weather started out a bit iffy again, but by the time we got back across the bridge, it was looking much better. We stopped for a late lunch at Thunder Island Brewing. I was pretty impressed with what I got to eat. Plus if you get there in a “non-motorized” manner they will take a $1 off your tab. 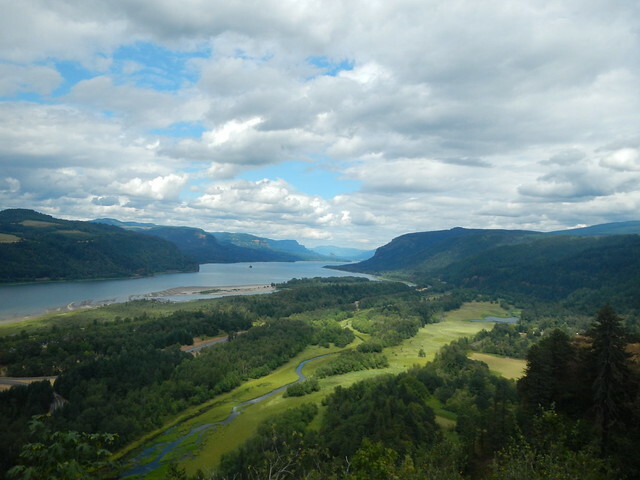 Unlike the day before the views from Vista House were pretty spectacular. 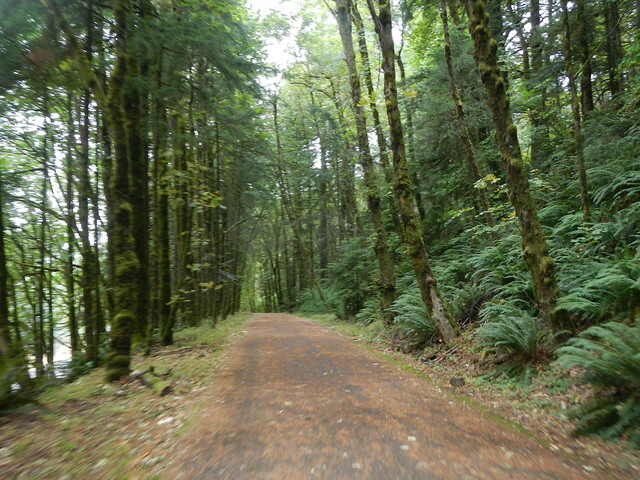 It was a nice ride with Cyclewild again. I’d like to thank Erinne and Maria for leading. 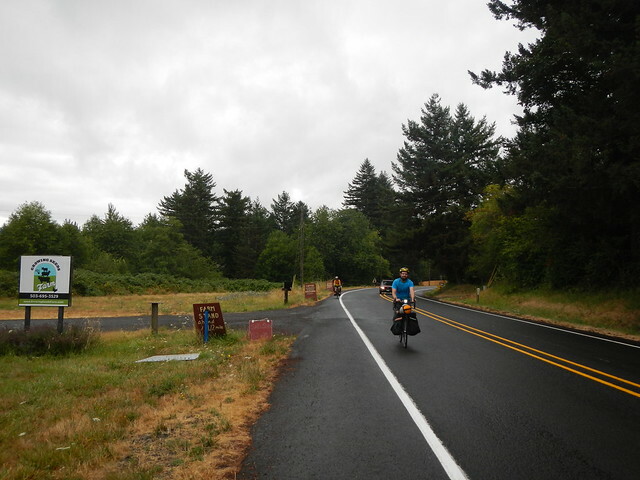 I was psyched to start adding more to my bike route knowledge and I was happy to meet some new people. You had to pay the toll? Dang. I’ve always been waved through. Maria and Erinne both indicated they have had to pay when going through as a group. Wondering if they are more lenient on singles? As for size of camping group, yeah, easy ones like Stub Stewart tend to sell out, while the more challenging ones don’t. However, if the ride just went to Thunder Island, there’d be a lot more people!